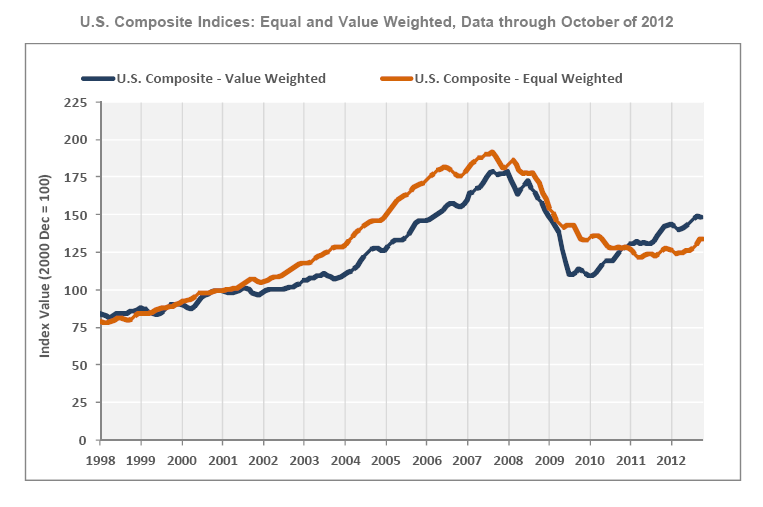 The two broadest measures of aggregate pricing for commercial properties within the CCRSI—the equal-weighted U.S. Composite Index and the value-weighted U.S. Composite Index—saw very little change in the month of October 2012, dipping -0.1% and -0.8%, respectively, although both improved over quarter and year-ago levels. Recent pricing fluctuations likely signify a more cautious attitude among investors stemming from uncertainty over U.S. fiscal policy heading into 2013. The number of distressed property trades in October fell to 14.8%, the lowest level witnessed since the first quarter of 2009. This reduction in distressed deal volume should result in higher, more consistent pricing, and lead to enhanced market liquidity, giving lenders more confidence to finance deals. This graph from CoStar shows the Value-Weighted and Equal-Weighted indexes. As CoStar noted, the Value-Weighted index is up 35.0% from the bottom (showing the demand for higher end properties) and up 6.1% year-over-year. However the Equal-Weighted index is only up 10.0% from the bottom, and up 5.9% year-over-year.